How much evidence would you need to believe in something? Would second hand sources be sufficient or would you need an eye witness account? If you could read a hand written account of the death of Jesus from someone who was there, would that be enough to commit yourself to Christ? That’s the question posed by Luedke’s graphic novel Eye Witness. This graphic novel is split into two segments in two different time periods. There’s the framing sequence which features celebrity forensic archaeologist, Doctor Terence Harper. Then there’s the middle section which shows us the week leading up to the crucifixion of Jesus. I’m going to deal with these two sections separately. It’s the modern day and Dr Terence Harper and his research assistant are on their way to the Middle East. A rare document has been uncovered that only Harper can decipher. Could this document be conclusive proof that Christianity is true? And to what ends will people go to suppress this information? As I was reading Eye Witness, it struck me that Harper was very much in the Robert Langdon mould of protagonist. An academic who knew a lot about the Christian faith and it’s origins, but wasn’t a believer himself. Someone who was best suited to a library who would be soon thrust into life threatening adventure. The problem with Harper though is that I just don’t buy him as a character. The framing sequence contains some very stiff and stilted dialogue. The fact that Harper is not a believer, despite everything he has seen is driven into the reader, in a way that does not feel organic at all. In some respects, I wish that the framing sequence wasn’t there at all because I feel it detracts from the novel’s strength – the section set in the first century. The document that Harper translates is a first hand account of the events in Jerusalem surrounding the death of Jesus. It’s here that Eye Witness changes dramatically. We see the final days of Jesus in Jerusalem. The dialogue that was stilted in the framing sequence now sounds much more natural. It feels like the author no longer feels he has to prove anything with the dialogue and lets the story speaks for itself. Which is a great thing. Luedke doesn’t stick slavishly to the Biblical text when the characters are speaking, enabling him to stick to the truth of the events without having to make sacrifices when it comes to translating the story from the written text to the graphic novel medium. I wish more artists and movie makers would move in a similar direction, showing us the greatness of the Bible story without feeling they need to stick 100% to every single word recorded. This section is by far one of the best told graphic novel versions of the life of Jesus I have ever seen. The art is dynamic and engaging. Interesting choices are made for panel arrangements with a variety of angles and close ups that bring the story to life. And the colouring, which I believe has been redone for this version is top notch. It feels like a modern comic with art that is comparable to most professional level comic art on the shelves today. For a Christian comic book, that’s incredibly high praise from me. Luedke has made some interesting theological choices with how he presents the material. These are choices that I’m familiar with in academic circles that I don’t necessarily subscribe to myself. These include: portraying Judas as a zealot, who handed Jesus over to force his hand as the Messiah; the presence of Saul of Tarsus in the passion narrative; the presence of Mary, mother of Jesus, in the Garden of Gethsemane; and an interesting construction of the cross. While I don’t agree with these inclusions, I would not say that they are invalid and need to be removed. However, I would act with caution before giving this novel to someone to read, wanting to discuss these issues with them. The revelations of the document, as presented in the middle section, cause Harper to question his lack of faith. This is the point where my disbelief could be suspended no more. Here is a man that had seen all the archaeological evidence for Jesus. This new document is no more valid than any other document. It doesn’t prove the existence of Jesus any more than any other document. It doesn’t describe the resurrection or anything else miraculous about Jesus. All it proves is that there was a man named Jesus who was executed. I find it difficult to believe that this document would move Harper in a way that the Gospels didn’t. I haven’t read the next two books in this series, so I don’t know where Luedke goes from here. I hope he spends more time in the first century, because it is this aspect of the book that I enjoyed. The story in the modern day on the other hand left me cold. I would love to see Luedke present the whole story of Jesus, from birth to death to life again. 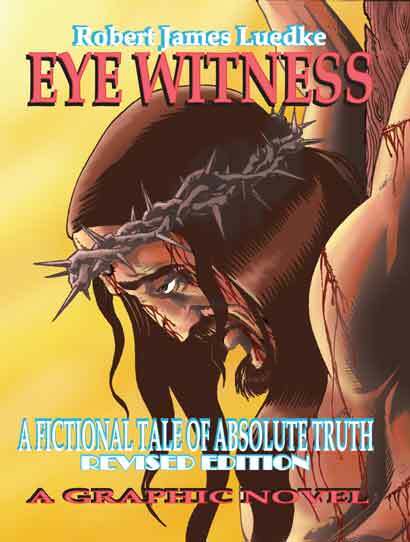 If you’d like to read Eye Witness Book One for yourself, head on over to the Head Press Publishing website. The first book is available to download as a PDF for only US$6. At 88 pages it’s well worth it. 1. This book is the first in a series of four. Though it was originally created as a stand alone GN, shortly after its completion, I was compelled to tell “the rest of the story” (so to speak), by both those who read it and through my own prayers. I bring that up, because I think you’d agree, it’s hard to judge a novel after only reading the first 25% of it, and basically with your dismissal of the modern day narrative based upon the 20 pages devoted to it here…is what you are doing. Book one is basically supplying the foundation upon which the rest of the series is launched from. 2. I think you might be missing the power and sensational nature a discovery the nature of which I am proposing here and the effect would have on our world, not to mention this one middle aged, slightly burned out skeptical scientist. In developing the character of Dr. Harper, he admits “Cause for me there’s a difference between proving the historical and geographical record and declaring belief in something I’ve yet to find the evidence to support” (re: the events described in of Jesus’ passion week and the Gospels). You state in your review, that he’s seen “all the archeological evidence for Jesus,” which precisely follows my point….because there really is none, outside the Biblical narrative. So as a man rooted in a “show my the trace evidence” kind of mind set he cannot embrace faith…though through the weary spirit I paint for him in the initial sequence, (purposefully through that “stiff and stilted dialogue”), he clearly needs it in his life (he’s suffering from what ancient Christians call, “Accidie”). A. The document Dr. Harper translates is a first century description of Jesus and the events surrounding his arrest, trials, execution and resurrection. One of the key points for skeptics of the Bible, is the fact that the earliest versions of the narrative we have are (I believe and I’m going from memory since it been about 8 years since I did this research) from the third century A.D (or written 300 years later)….and those have most likely been transcribed between a couple different languages and various scribes over the centuries. My fictional discovery is an original document written by an eye witness to these events and written in his own hand!! Archeology has NOTHING comparable to this. B. The eyewitness in question was not one of Jesus’ disciples or followers, but more of an independent observer to the events given the duty to record Jesus actions to be used against him. So this also overcomes another big skeptical stumbling block…that the Gospel story was sensationalized over the years and in subsequent translations to bolster the beliefs of the disciples and the followers of this new faith. This document proves that was not the case and thereby gives further credence to the Biblical narrative. If this type of document actually was uncovered, in say a location like “The Dead Sea Scrolls”….it would literally be world changing! C. If we believe the narrative all the way to it’s conclusion, Jesus did die and was resurrected..thus proving to all faiths (not just Christians) that Jesus was more than just a wise man-teacher-rabbi-prophet…but truly the son of God! This would also be pretty big news for obvious reasons. C. And finally, according to the translated narrative, the spikes found in the same ossuary as the scrolls are the crucifixion spikes used on Jesus! Now what bigger piece of evidence could a scientist ask for? And if they choose to believe the narrative of the translated scrolls, it would just go to follow that they believe that the spikes could be what they say they are… (DNA anyone)? (END SPOILER WARNING)….So as you can see the monumental nature of this discovery is the linchpin that drives the whole modern narrative. Without that the events might not make as much sense or contain as much drama, but I think if you reconsider what I’m purposing Harper has stumbled upon, I think the work as a whole might make better sense. 3. Finally…yes I do have a lot of fun taking the Biblical narrative and making the words and story work in a contemporary sense and I do make some character choices that either expand upon what’s in the Biblical narrative, or (as you have alluded to) are merely speculated about by theologians. This has been done with the goal of helping the story flow better and be easier to understand, especially for readers who are not avid Bible readers. I call this my “Ten Commandments Strategy”, after the famous Cecil B. DeMille Film, (starring Charlton Heston). The movie took many liberties with the scriptures upon which it was based, but all in the name of making one heck of an entertaining epic, that for many generations was the vehicle through which people gained an understanding of the story of Moses, the Ten Commandments and the Exodus.